Many of the links below lead to documents in PDF format. If you are using a Windows-based computer (e.g., XP and Vista), you will need a PDF Reader like Foxit or Adobe -- both of which are 100% free to use. 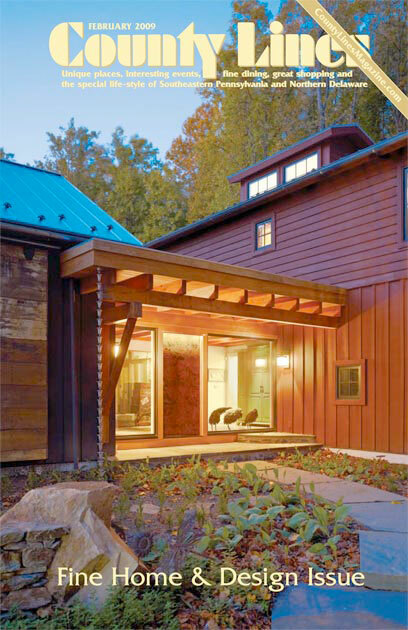 Feature Story by Matt Freeman: "Timeless Charm, Sustainable Future: Green is Beautiful". "Little green house on the prairie"
"Couple takes the LEED in green construction"
"Building green comes naturally to Kennett couple." Article, "Lay of the Land - A Kennett Square beauty turns the farmhouse motif on its head." Press Release, "NEW RELEASE: THE GREEN BEGINNINGS VIDEO". The Green Dream: A Kennett property gets the environmentally friendly treatment and turns its owners into role models. This new LEED Silver home shatters the myth that green houses lack comfort and luxury. Story by Matt Freeman and photos by Matt Freeman, John Lewis, Rick Ziesing. "...most people participate in environmentalism only when it's easy or convenient. The Topels' passion for an ecologically sustainable home was neither." "...the authors provide sound advice and education...(and) the book remains entertaining and educational for both the average consumer and those looking to embark on their own green journey. 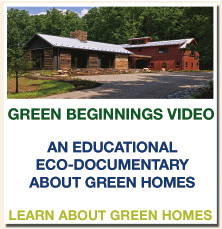 An excellent, informative guide to sustainable building." You'll need to scroll down the page a little to see the review. "Going green might be all the rage, but how does one apply it to the core of ones life, to ones home, top to bottom? 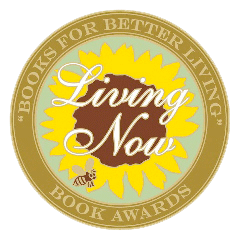 In Green Beginnings, readers are guided through the thought and practical process of making sustainable living a reality with depth, beyond adding CFLs and extra insulation. A must read for anyone designing or redesigning their home with our global home in mind." Gang Chen, LEED AP, and AIA, author of "LEED AP Exam Guide"
"A valuable book for anyone interested in going green or building a green home, January 5, 2009"
"Green Beginnings: The Story of How We Built Our Green & Sustainable Home" is an important contribution to the revolutionary trend of Going Green." 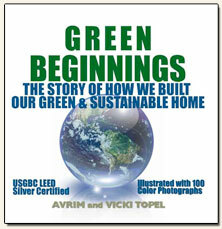 "It is a valuable book for anyone interested in going green or building a green home." Environmental engineering and Consulting firm who were the LEED Providers for our project. "Philadelphia based educational classes, events, and advocacy." EcoBusinessLinks is your Green Directory for organic food, cheap clean energy, sustainable home resources, organic cotton, a vegetarian date, an organic farm, a sustainable community or eco-friendly products. A comprehensive directory for all things green. EcoBrain offers a top-quality selection of eBooks and mp3 audio about the environment and environmentally-friendly living. All content on EcoBrain is in downloadable, digital format, so you can buy green with zero use of forest-pulping paper and only a minimal amount of expended energy. Sustainable Living and Energy Conservation from Discovery.com. New and updated information about green & sustainable homes, design and construction based on our experience planning, building and living in our green home. Reference Green Beginnings Voice of Experience topics using our TABLE of CONTENTS. See our News and Resources section for more useful information and links. Hugh Lofting Timber Frames presents how the project comes together. A PDF document showing the concept rendering by architect Matthew Moger. The 'LEED Certification Mark' is a registered trademark owned by the U.S. Green Building Council and is used by permission.